Home | Feature | NES | Super Mario Bros.
Brought to you by a Mac Plus, ClarisWorks, and no idea how paragraphs are supposed to work. Super Mario Bros 3 is 30 years old this week. That means its knees are probably shot, it likely needs at least one root canal, and it's clutching at fistfuls of its thinning hair while wondering what the hell it's going to do with its life. Maybe not. Super Mario 3's managed to cling to the near-universal love it received upon launch, and for good reason. Mario's second adventure in the Mushroom Kingdom (third if you count Japan's Super Mario Bros 2 / our Lost Levels) is such a leap over his premiere trip to the realm, it's still amazing to look back on. Super Mario Bros 3's level design is unparalleled on the NES, and I never stopped admiring the game's atmosphere and imagination. Dark Land is still one of my favorite regions in a Mario game. I love its dark skies, its blacked-out world map, and its twisted fortresses. Even the "Hand Traps" continue to creep me out a bit. Whose hand is that. Super Mario Bros 3 didn't arrive in North America until February of 1990, which allowed schoolyard stories and rumors plenty of time to germinate. I remember the first time I heard about the game: I was riding in a carpool with some kids who informed me Japan already had it. I was a stupid nine-year-old who could barely walk around her neighborhood without getting lost. When my fellow carpooler told me "Mario 3 is out in Japan," he may as well have told me "Mario 3 is out in Narnia." It felt like something I'd never be able to see or touch, let alone play. But time inevitably did its thing, and Super Mario Bros 3 zoomed westward on a cushion of hype thanks to The Wizard's theatrical run. I had a personal problem, though: I lacked an NES in 1990, let alone a copy of Mario 3. I played bits of the game at friends' houses, but for a long time everything I knew about Mario 3 came from (sigh) the syndicated DiC cartoon. I sigh, but I have to give the cartoon credit: It inspired me to write my own Super Mario Bros 3 fanfiction for a class assignment. And oh, what a fanfic it was. The Adventures of Super Mario Bros 3 is better than the Super Mario Bros Super Show that preceded it, and it's far better than the Super Mario World cartoon that succeeded it. That's still not saying much, though I still love its deceptively foreboding intro. I sat week after week and slowly absorbed episodes of the Mario 3 cartoon because I was desperate for any kind of Mushroom Kingdom fix. I was around 10 or 11 at the time; old enough to recognize the writers behind The Adventures of Super Mario Bros 3 just wanted to get paid, and certainly old enough to be resentful about their nonchalance. I would have performed wetwork for a chance to write for the show. However, Mario's animated adventures briefly won me over with "Oh, Brother," an episode wherein Mario and Luigi briefly part ways after a fight. The show opens with Luigi getting on Mario's case about playing his crummy music too loud (and Mario is dancing with a plunger-there are many implications here, and they're all disturbing). When Mario refuses to turn down his record because it's "hot," Luigi throws it on the fire and declares, "There, now it's even hotter." A physical altercation ensues, (punctuated perfectly by Mario 3 sound effects), and Luigi walks out into the storm. The episode's remaining 20 minutes are typical of the show: Bowser and the Koopa Kids get up to the dickens, Mario and Luigi stop it, and yabba-dabba-doo. My imagination churned over those opening moments for some time afterwards, though. I said to myself, "What if there was, like, an entire story where Mario and Luigi fight and screw up and hate each other?" I started pouring my brain-power into this story idea of mine, because I sure as hell wasn't using that brain-power to try and figure out how long division worked. The resulting fanfic, which I so-cleverly named "The Untitled Adventure" was typed across the remainder of my grade six school year (everyone in the classroom was allowed one scant hour of computer time a week). With the aid of ClarisWorks and a chunky Mac Plus keyboard, I slowly gave birth to what can best be described as a shitpost that spans a few thousand words. That's a veritable novel for a ten-year-old, you understand. I don't know if I can even competently summarize what I coughed up. Sometimes it's clear I'm trying to re-tell the story of Super Mario Bros 3, and sometimes I get caught up in telling a whole new story. I still have the tale-all those glorious dot matrix-printed pages-and it's embarrassingly littered with grammar and spelling mistakes. Paragraph breaks are rare; I seemingly inserted them willy-nilly, or whenever I realized, "A break here would be good for comedic ('comedic') timing." Here's the opening paragraph. Let's hear it for that Chicago Outline font I used for the title. Go to hell Luigi, Godzilla is an important cultural touchstone. One cold, rainy night, a plumbing shop stood alone in the middle of Brooklyn, on the corner of 3rd Street. It was empty, except for two plumbers named Mario and Luigi. They were in the back room, watching Godzilla on video tape. "Boy!" said Luigi. "What a stupid movie! Why do you get to pick the movies all the time?" "Because you'd pick Sesame Street," said Mario. The opening paragraph sets the tone for the rest of the story: Neither brother is charitable towards the other, ever. 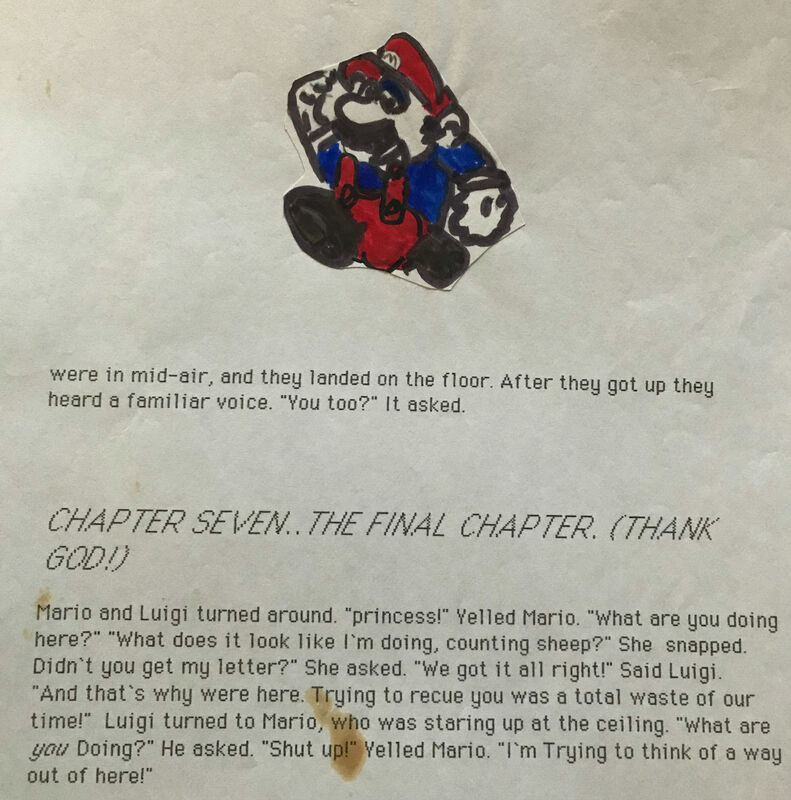 If nothing else, I think my ten-year-old self made good on her promise to have Mario and Luigi act like absolute dicks to one another. Also, the original document misspells "Sesame Street." If I couldn't spell "Sesame Street" by the time I was ten, can I truly say it educated me? This is one of those "Tree falling in the woods" conundrums. The Brothers' movie is interrupted when they get a call for a job at a shady address. They're broke and greedy, so they take it. Their "creepy" client avoids paying the bill by throwing them into a pipe that exiles them to the Mushroom Kingdom ("Why does he have a warp to the Mushroom Kingdom in his house-" Sorry, man, I can't help you). This is where the Adventures of Super Mario Bros 3 truly begin. '80s Mac fonts, we did not deserve you. "Where are we?" Mario asked. "How am I supposed to know?" asked Luigi. Suddenly Mario said "I know where we are! We're back in the Carrot Kingdom!" "Boy!" said a voice from behind. "Do you need help! This is the Mushroom Kingdom!" Princess Toadstool led them to the castle and opened the door. Right away, a dog with a crown on his head met them, wagging his tail. "Well there you go!" the Princess said. "I don't see any difference," Luigi said. ...OK that's still kind of funny. I'm pleased to report I'm missing huge chunks of the fanfiction. Apparently, I printed out chapter one five times, but I only have the tail-end of chapter six and the introduction to chapter seven, the last chapter. Going by chapter seven's title, I get the impression I was fed-up with the project by the end. Don't worry about that stain. It's nothing. Oh, but that's a cute illustration of Mario! Good job, little me! Mario and Luigi turned around. "Princess!" yelled Mario. "What are you doing here?" "What does it look like I'm doing? Counting sheep?" she snapped. "Didn't you get my letter?" "We got it all right!" said Luigi. "That's why we're here. Trying to rescue you was a total waste of our time." To the Princess' credit, earlier in the story she tells the Mario Bros straight-out that she called for He-Man to rescue the Mushroom Kingdom, and she wound up with them instead. "Sucking at Something is the First Step to Being Good at Something." Looking back on The Untitled Adventure has wracked me with physical pain and mental anguish, but it was also my first big writing project. Considering the path my life and career eventually took, I guess this is a pivotal piece of work. I loved writing it, it proved a great creative outlet, and my classmates thought it was funny. Thinking about it, I'm lucky my teacher praised this story instead of ripping it apart for its technical mistakes-or worse, accusing me of plagiarism (I had a writing teacher years later who considered writing fanfiction to be a creatively bankrupt pastime at best, and outright theft at worst). I was an easily-intimidated slip of a child, and disapproval could've snuffed out my desire to continue writing and sharing my stories. I still think fanfiction is an excellent way for kids to gain and / or nurture an appreciation for writing. I hope there aren't too many teachers out there telling their kids, "No, you can't write a story about Fortnite. That's not real writing." God bless the children, especially the children who hand in badly-formatted stories about comedic misfortunate befalling licensed characters. Happy anniversary, Super Mario 3. Thanks for giving me the courage to commit literary atrocities in your name. Tagged with Feature,	NES,	Nintendo,	Retro. More about Super Mario Bros.
Three new games headline this month's free NES classics.